May 4, 2015 0 comments on "Canning Cherries"
Canning cherries is a great way to make sure your cherries last until cherry season next year. We’re right in the middle of cherry season, and it’s time to start putting our stash away for the winter. If you visit a local cherry orchard you can find cherries as low as $2.00 a pound, compared to the $4.00-$5.00 you will find at the grocery store. Yesterday my boys and I picked 20 pounds of Rainier cherries. In addition to making homemade maraschino cherries, I also canned three quarts and made three pints of cherry jam. I’m waiting for my Clear Jel to get here in the mail so I can try out a recipe for homemade cherry pie filling. Here is how to can cherries in a simple syrup. To make a simple syrup, all you need is sugar and water. For sweet cherries like Bing or Benton cherries, you only need a light syrup. You may want to use a medium syrup for less sweet cherries like the Rainier cherries. To can cherries in a raw pack, all you need to do is wash the cherries and pit the cherries with a cherry pitter like the Norpro Deluxe Cherry Pitter . Seriously, if you don’t have a cherry pitter, you need to get one! They are not expensive and save so much time while preparing cherries for canning. (You don’t HAVE to pit the cherries, however. Some people prefer to can them with the pits still inside. It’s up to you). After you pit the cherries place them in clean, sterilized quart sized canning jars. Pack them in tightly. Prepare the syrup before you prepare the cherries so the syrup will be hot and ready to pour after you have packed the cherries in the jars. To prepare the syrup, just place sugar and water together in a sauce pan and boil for 5 minutes, until the sugar has completely dissolved. After you have filled the jars with the cherries and syrup, wipe the rims of the jars off with a damp towel and place hot sterilized lids and rings on jars. Process the jars in a boiling water canner for 25 minutes. Remove the jars from the boiling water canner and let them set on a towel on the kitchen counter until the jars are cool and all lids have sealed. These jars can be stored in your pantry for a year or more. Like this recipe? 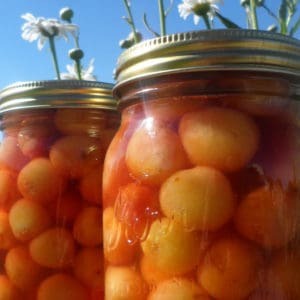 Try this recipe for canning maraschino cherries.